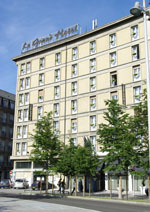 Le Grand Hôtel is conveniently located opposite the train station. The rather unimpressive building from the 1960s hides a recently renovated stylish 3 star hotel. The hotel is conveniently located just opposite Strasbourg's recently renovated main train station. Travellers coming by train will appreciate this, as they can leave their baggage and get information from the front office before exploring the city. A walk to the city center takes about 10 minutes, to the cathedral, 15 minutes. Le Grand Hôtel is also a good starting point for exploring the Alsatian Wineroad, as car rental offices can be found in the vicinity. Breakfast is complimentary and served in a buffet style in the breakfast room and its adjoining terrace, and offers a much wider selection than the typical French breakfast consisting only of croissants and coffee. In the evening, guests can have an aperitif in the hotel bar before exploring the restaurants in the vicinity. The cozy bar stays open until late at night. The Grand Hotel has 81 rooms in four categories: Classic, Tradition, Privilege and Exclusive. All rooms are air-conditioned and are equipped with mini bar, safe, and LCD TV. Cable and Pay-TV are available. The ensuite bathrooms are furnished with showers and hair dryers. Many rooms offer a stunning view on the main train station, renovated in 2007. Breakfast and wireless internet access are included in the room price. The front desk is open 24 hours a day, with English and German speaking staff. Pets are accepted for a small charge. While the hotel does not have its own parking, hotel guests can use the parking garage near the train station at a reduced charge. The same goes for sports facilities - hotel guests may use a nearby gym at a discounted charge. For business conferences and seminars, Le Grand Hôtel offers has six meeting rooms, which can seat up to 100 persons.